When was the last time you looked at the underside of your table? Or – if you are a prosperous two-table establishment – tables? Mine was a revelation. Why I bothered scouring the top when such a microbiological feast was thriving on its underside, I do not know. I have taken a cloth and strong disinfectant and banished the tiny shanty town underneath. It took three hundred years for them to look underneath one particular table: but if anyone had looked underneath before it would not have survived. For there was hidden a priceless work of art; a work they would, at one time, have paid men to burn. But the reformists did not think to look under the table at Norwich Cathedral, and the Despenser Retable survived. Five panels, each on the theme of the death and resurrection of Christ, nevertheless include vital clues as to the retable’s origin. Several shields identify knights who fought alongside Richard II in the Peasant’s Revolt, and historians now think this gorgeous piece of work was created in thanksgiving for victory. It is even possible Richard II and his beautiful wife, Anne of Bohemia, were there for its dedication. The only reason this treasure survived was because everyone thought it was a table. Because reformation, in England, meant the tearing out of images and the burning of wood. And though much historical vandalism has happened in the almost 500 years since, nothing quite irks me like the thuggery which lost us so many treasures here in England. There’s a picture. 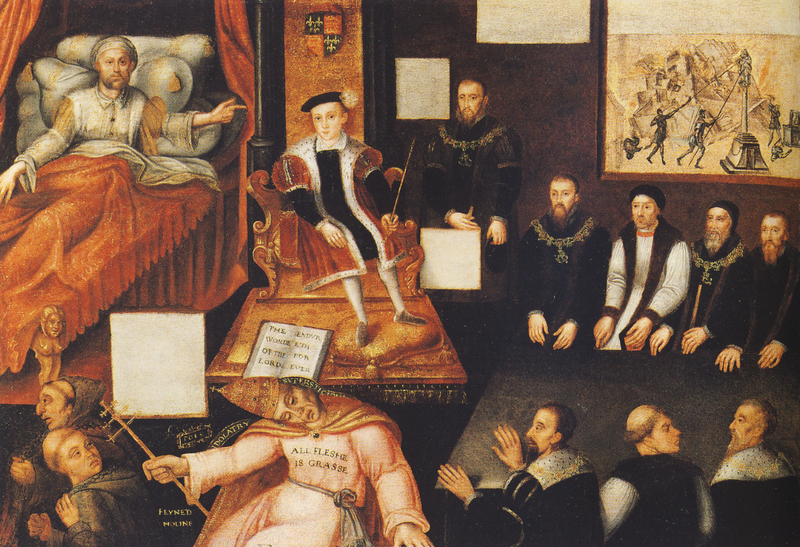 It portrays Henry VIII on his deathbed, pointing to his heir and successor, Edward VI. And if you look carefully, in the background, there is a picture I find chilling. 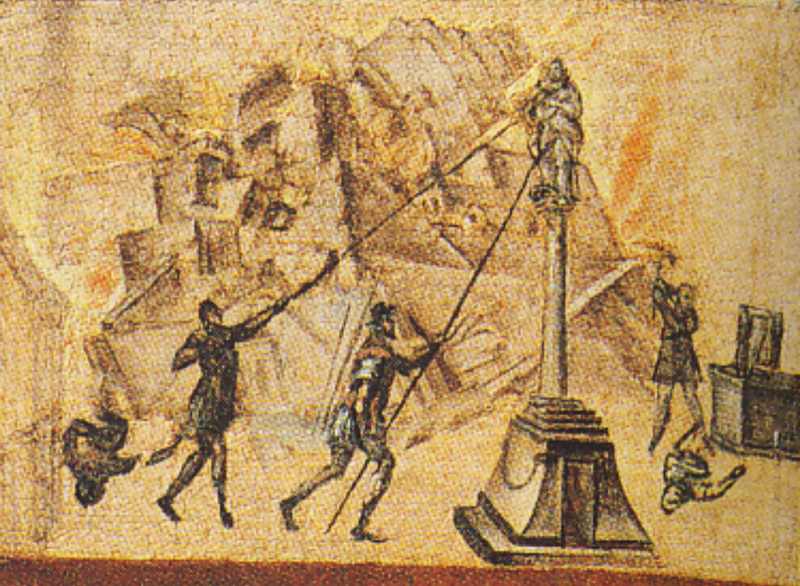 It shows men tearing down a statue. I can see why they did it, I hate my religion florid myself, but one look at the underside of that table and we have a tiny taste of what was lost. Funeral director Henry Machyn – unearthed by Roy Strong in his Lost Treasures of Britain – wrote of the carnage: he said they made “great [bonfires] of rodes and mares and Johns and oder emages, ther thay wher bornyd with gret wondur”. Gone. All gone, destroyed by men like the ones in that picture. Posted in Quirks of HistoryTagged Despenser retable, Edward VI, history, Norwich, ReformationBookmark the permalink. I suppose so, Roger. Humans build and they destroy. There is one in Norwich Cathedral which was saved the same way. The destruction is unimaginable when you really start to look. Erk! I got my Nottinghams and my Norwichs mixed up, Stephanie, the two tables are are one and the same. Apologies: blame the early morning. As for what was lost: we have had centuries to regret what happened, and the loss never lessens. IE, i couldn’t have put it better myself. If a minority destroy something, others have to live with the legacy. ‘Tis a daily wonder that man still exists on this small pebble. 😀 Bother. Never mind, if it’s an antique that must count for something! Unfortunately during WWII history was repeated with many great books and art burned because of the peoples ancestry….the human toll was far greater. Evil will always find a way to destroy what is good. It does. But somehow, good manages to survive. It never ceases to amaze me. I fully agree. Good is the only thing that provides hope. Without hope there is nothing. The extreme actions of zealots never ceases to amaze me. I know. So heavy handed. Back to the “no fun in fundamentalist.” This reminds me of the outrage people felt several years ago when the Taliban blew up some old carved statues of Buddha (maybe 1500 years old, not sure) because they were blasphemous. Wasn’t the ancient library in Constantinople burned down by vigorous Crusaders from Venice who weren’t above whacking the eastern branch of Christianity? What a world. I think self righteousness is the greatest sin (says I, self righteously). Gale, it was your comment which started me thinking about today’s post. I think you are right. HAving a closed mind – it’s lethal. I don’t believe that I’ve ever looked but as the mom of three boys, ewwwwww. Albeit, if there is a fancy piece of art, it is now covered in boy grime. Maybe it’s a good thing that some of these relics are no more. 😀 That’s it, unvarnished. But allow me a hanker. I do not live completely in the present. It’s really shocking to me when I think about it. The belief that iconography and art could be so powerful that the only answer was to destroy it, seems frighteningly current in some places in the world, but when we get tempted to point fingers, I think she have our own examples of misguided zealotry. You’ve mentioned the Reformation a couple of times lately, Kate, and I share interest in this period. My Protestant education didn’t really like to focus on the destruction part. We pick and choose what we want to extoll. How wonderful that the table protected such amazing representations of that period. I wonder what else survived in the same remarkable way! I wonder if those who were doing the destroying thought they were doing the ‘right thing’, Kate, or maybe they were just following orders. The things that survive are all the more special for it, but even so it would be nice for more to have survived also! I’m not happy when I see that a really nice looking old building has been removed for a road or something. All that history gone. Sigh. This causes one to reflect on how religion gets the credit for inspiring many wonderful works of art, and the blame for the destruction of masses of others. In the final analysis, it isn’t religion at work here, but man’s greatest and vilest characteristics using a religious pretext? Dear Kate, I read this posting with great interest and found it thought-provoking, per usual. Then I read all the comments and found they equally fascinating and representative of the many points of views your readers so often express. I find myself in total agreement with “Redneck George” who says that without hope we are nothing. However, I’d add to that. Without a sense of gratitude we perish. Peace. Gee, thanks, Kate. Now I have to throw away my table. Power and money turn people into monsters. One thing I admire about Europe is how so much art and architecture has been preserved-all the rich tradition. America is in still it’s adolescent phase. What old buildings remain are under constant threat from developers and money grubbing speculators. What we are left is an endless expanse of sameness, where all towns look identical. It’s, for the most part, an endless arid, soul destroying landscape of shopping malls, Starbucks and Walmarts. You Brits are wealthier by far in this regard. And it still happens, doesn’t it? Just think of the pyramids and other icons that were lost due to the religious views held by the thugs who wished to banish all references to that culture. Extremely upsetting.